A partnership between three Northland based Maori tourism companies and InterCity Group was celebrated on Friday with the launch of Aratapu – a sacred journey. The companies are Waka Taiamai Heritage Journeys, Footprints Waipoua – Crossing Hokianga, and Culture North. 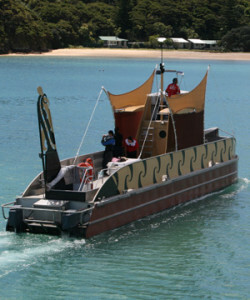 To mark the occasion a powhiri was held on Urupukapuka Island, where the redesigned Nautilus vessel, previously used as part of the Fullers Bay of Islands operation, was escorted into Otehei Bay by the Culture North waka Te Whiu, paddled by Northland College students under the leadership of Wiremu Wiremu. InterCity purchased Fullers Bay of Islands last year. The new vessel will give visitors a taste of Maori mythology. Attending the blessing by Bishop Ben Te Haara and the powhiri were Cabinet Minister Shane Jones who described the initiative as brilliant – “To open up the secrets of the Waipoua Forest and join it with the unrivalled beauty of the Bay of Islands – I Pipiri – reflecting the historic relationship between the West Coast and the East Coast. “This kind of initiative is the way of the future,” he says. To read the rest of this article, please visit Stuff.co.nz.